Enthusiasts for social media would no doubt have us believe that Kingâ€™s task in Birmingham would have been made infinitely easier had he been able to communicate with his followers through Facebook, and contented himself with tweets from a Birmingham jail. Gladwell’s digital absolutism ignores the true hybridity of digital activism: it’s often mixed with offline tactics. Â However, when he writes that “Kingâ€™s task in Birmingham would have been made infinitely easier had he been able to communicate with his followers through Facebook,” he’s right. Â I also think Martin Luther King, Jr. would have tweeted, though not to the exclusion of all other tactics, as Gladwell implies. Â In fact, I can think of little reason why King, a great believer in the power of the public word, would not have used every tool at his disposal. The campaign mixed online and offline tactics created by new and historic networks. Now, of course, we get into the realm of counterfactuals. Â If only there was a major recent civil-rights case that we could somehow use to test whether civil-rights activists would use social media if they had the choice. Â And there is such a case – the campaign to demand justice for Trayvon Martin. This case, which I described this past week at a training for the YMCA national leadership symposium, shows the true hybridity of activism in the 21st century. Traditionally offline and strong-tie networks, like those used during the Civil Rights Movement, collaborate with new online and weak-tie networks, whose members are connected by Twitter, Facebook, and Change.org petitions. Â The two more successful tactics of that campaign, the Million Hoodie March and aÂ Change.org petitionÂ with 2 million signatures, were either digital or hybrid, and were created by people with weak ties (or, one could argue, no ties) to Trayvon’s family. The reality is that both offline and online tactics are often needed to attack injustice, and the two are not so clearly demarcated as we think. Â A blogger named Daniel Maree organized the Million Hoodie March in New York using an online tool (Facebook) in order to drive online action (signing a Change.org petition calling for the prosecution of Trayvon’s killer). Trayvon’s parent and the civil-rights leaders that advised them did not initiate these digital actions, but they did adopt them. 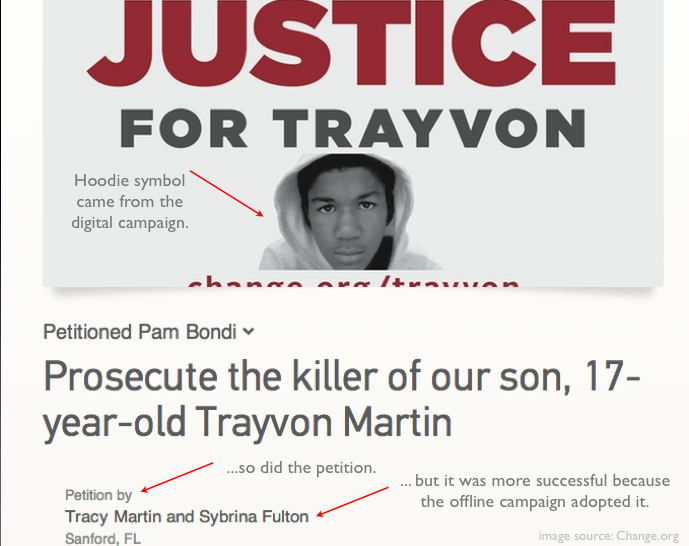 Â They took over the Change.org petition (originally started by a DC lawyer) and they adopted the hoodie symbol, developed by Maree and his colleagues. Â They didn’t adopt these digital tactics and symbols because they were “enthusiasts for social media.” They adopted them because they worked, because the Change.org petition had become the focal point of national outrage and the hoodie symbol had become a transcendant means of motivating and expressing solidarity. The online-offline dichotomy presented by Gladwell was and is false. Â The dichotomy of strong-tie and weak-tie is also false. Â Savvy strategists will use whatever tools and tactics are available to them and mix them at will. The full slides from my presentation are below.